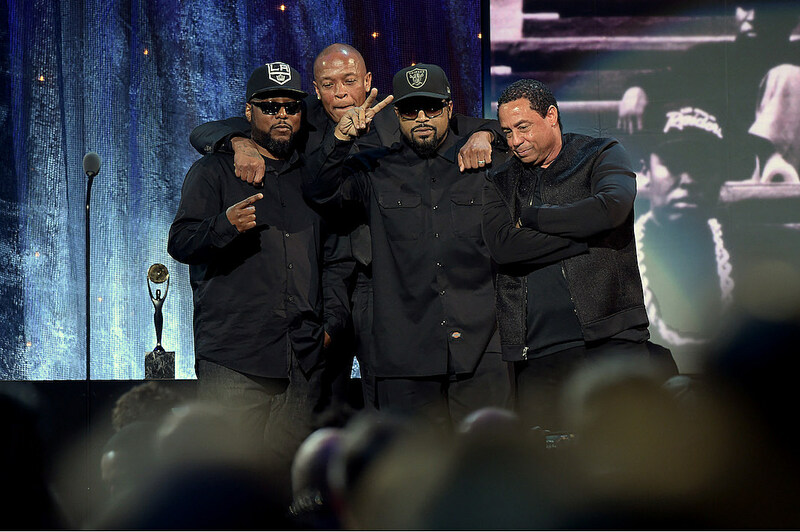 N.W.A Inducted Into Rock and Roll Hall of Fame, Insist "Hip-Hop Is Here Forever"
Cheap Trick, Chicago, Deep Purple and Steve Miller were also inducted at the coveted ceremony, held at the Barclays Center in Brooklyn Friday night (April 8). N.W.A was the fourth group to be recognized after an opening by David Byrne and The Roots and most of the 2016 Rock and Roll Hall of Fame class. When it came time for the historical Compton group’s recognition, it was a highlight in the four-hour event and a moment all rap heads had been waiting for as “You are now about to witness the strength of street knowledge” boomed over the speakers, the coveted opening from the group’s flagship song “Straight Outta Compton.” Kendrick Lamar then took the stage, seemingly in awe of the fact that he was chosen to assist in such a important moment in hip-hop and welcome Dr. Dre, Ice Cube, DJ Ren and DJ Yella to the stage. “N.W.A, man,” relished Kendrick before commencing on a favorable introduction of the group that birthed some of hip-hop’s most elite contenders. Before the rapper’s mentor, Dr. Dre, took the stage, Kendrick revealed Ice Cube was the inspiration behind his debut album, good kid, m.A.A.d city, and thanked Dre for helping him cultivate a platinum-selling career. Dr. Dre was the first up from the group. “What’s up, Brooklyn? Yeah. What’s up. I want to thank Kendrick Lamar for those beautiful words,” the mogul started before recapping his renowned career and thanking the late Eazy-E for giving him the opportunity to be on the stage. DJ Yella followed, also sending his praise to Eazy for starting them on the journey that got them to this point in their careers.”He was a great friend, good business partner. He just brung… the light… He had the money, of course, but you know, we did something,” Yella joked before moving on to MC Ren. Although the group did not perform as acts typically do when inducted, the moment was no less special. The moment signified that hip-hop has come a long way from its birthplace in the Bronx 40 years ago. For the group, its members at one point being constantly stalked and repressed by police, it meant they beat the odds. The one thing missing from the night, which was seemingly inevitable, was a speech from the man that started it all, Mr. Eric “Eazy-E” Wright.